Which Is The Trending Ring Metal For 2018? Home » Engagement Ring Tips » Which Is The Trending Ring Metal For 2018? On an engagement ring, if you use platinum, it will be 95% pure while gold ranges from 91.6% to 58% purity. While the white metal platinum is rising in popularity, band of gold for engagement is still the best choice worldwide. What distinguishes the two? Find out today in our comprehensive comparison of trending ring metal for 2018 below. From Heidi Klum to Jessica Biel, there is a uniform demand for gold and platinum engagement rings in the 21st century. Moreover, gold is older in history than platinum. What sets the two apart is not color because white gold is rising against the platinum probability in engagement rings all around the world. While the glitter of both these noble metals has to do with tradition and subjective reasons, the global trend gives us a clear idea of which is the trending ring metal for engagement rings today. History of Platinum is fresher than that of gold. Although platinum was mentioned in the European jewelry as early as the 16th century, it was not registered as a precious metal worth investigating until mid-18th century. Less corrosive than gold, platinum is used more in cars than jewelry today. Besides the automobile sector, if you research thorough platinum finds lucrative uses in the chemical field too. While the uses of platinum are widespread, it’s not as affordable as gold. Primarily because, variety of platinum is not as diverse as gold. Let’s find out how popular platinum trends worldwide in the last three years. Statistically, demand of platinum for 2016 in 1000 troy ounces is 8.083. While the price of platinum in November 2015 was $820, it soar to almost $1,100 in March 2016 and rose up after. This clearly states that platinum was trending exclusively just 2 years ago. Moreover, according to the World Platinum Council, the deficit in platinum rose from 135,000 ounces to 455,000 ounces. Rising by 3 thousand troy ounces from the past year, the platinum demand for 2017 is recorded at 8,086 troy ounces. While jewelry demand went down by 11% in 2017 according to World Platinum Council, the same was expected to grow at 11%. It is expected to increase by 2% by the end of the year. In total, Platinum was not as trendy as it is now, last year. Growing by 3000 thousand troy ounces from last year in demand, Platinum is 2018 was recorded at 8,310. It is 7.1% above the level of 2016 and the deficit expected to widen much more. Moreover, the forecasts went as predicted without drastic changes too. This year, the price of platinum is trending at $900 per ounce. Thinking back, it was $2,300 per ounce in 2008 higher than gold. Simply put, it costs $1,100 to mine ounce while the trading price is lower, making for a loss! History of Gold is as old as mankind itself as gold used in the form of money was popular as early as 700 B.C. With pockets of gold available in plenty, all the world’s platinum can be fitted into one medium sized living room. The difference is drastic between the two metals. 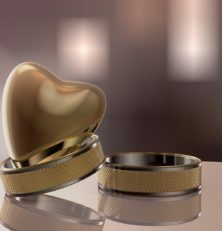 That is the very reason why gold is affordable and hailed as the universal symbol of engagement. Perhaps that’s why Don Cherry’s gold song became the popular ideal for getting married since the early ages. Whatever be the reason, today we are going to assess how widespread the popularity of gold is, against platinum. From 4,212.2 metric tons in demand, gold rose to 4,309 metric tons in 2016. Way higher than platinum, gold demand was the highest in 2016. In the U.S alone, the demand for gold rose by 33% this year, making it the best trending metal for rings. The stark difference between troy ounce and metric tons shows the higher preference of gold over platinum too. Dropping by 14% in the first quarter of 2017 alone, demand for gold was staggeringly low. The global demand of gold fell by 300 metric tons to 4,017 in 2017. Statistics quote an 18% decrease year-on-year too. Did gold survive the fall? Verdict: Platinum or Gold for 2019? By our comprehensive comparison, even though gold suffered a stark decline, it rose in demand by 2018. Today, platinum is cheaper than gold. Being less in quantity, the hype about platinum is similar to that of the BTC. If you’re buying a platinum ring for your engagement, you don’t have to worry about the purity while you need to worry about the purity when investing in gold for rings. Being available lesser than gold, platinum is the best buy. Do you prefer platinum or gold?